If you would like to be notified about new updates to SkipPad, join our Discord! 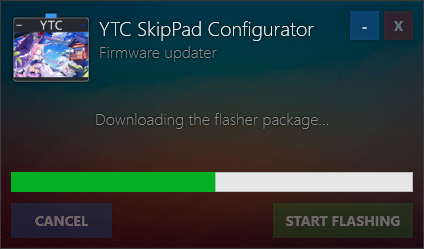 To update the SkipPad’s firmware to the newest version, simply download and run the YTC SkipPad Config Utility. Make sure the SkipPad is in the setup mode (see: Configuration) and click Connect. Second scenario: If the keypad has a software version compatible with the app version you have, it should successfully connect and show you the configuration window. Clicking “Yes” will open up the firmware flasher section of the config utility. 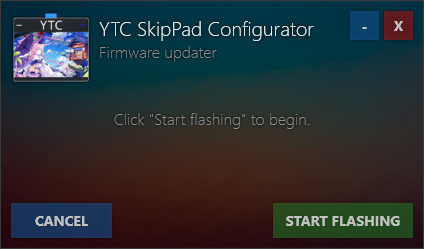 The firmware flasher is a part of the SkipPad Config Utility. It is accessible it by going through steps described above. Notice: In emergency situations, the firmware flasher can be accessed directly from the connecting window by pressing the CTRL+SHIFT+F combination. To start the flashing process, make sure the keypad is properly connected to your PC (so it doesn’t accidentally disconnect during when flashing) and click Start flashing. The app will ask once again to proceed the update and after that, the flashing process will begin. If there are any bug/errors encountered, please report them in #support on our Discord or send a direct message to TheWildTree#8645.